Thermal isolation of the house in winter. Is it worth it? Polyurethane is a polymer that is formed by the reaction of polyfunctional isocyanates with polyols. In addition, additives such as flame retardants, catalysts, silicone stabilizers and foaming agents are also used in the manufacture of the polyurethane. Polyurethane has been known since 1937 when two German scientists first published and patented the method of its manufacture. Currently polyurethanes (PU, PUR) are some of the most popular and widely used polymers in the world. What is a spray foam? Polyurethane foam spray (or: spray, PUR foam) is a proven insulating material mechanically deposited on an insulated surface. 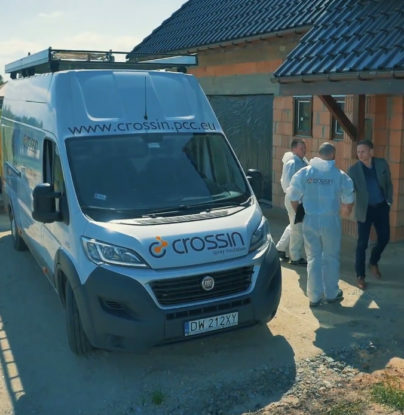 What are the dimensions and thicknesses of the insulation boards available in Crossin®? Standard dimensions of Crossin® Insulations PUR boards are 1000 × 600 mm with thicknesses from 2 to 20 cm. In the Crossin® Dual system, the standard dimensions of the boards are 922 × 600 mm with thicknesses of 2 to 20 cm. The Crossin Dual Crossin® PUR coverage is 900 × 578 mm. It is also possible to order insulation boards made of rigid PUR foam of larger or smaller dimensions. What are the types of spray foams? Spray foam can have a different structure. We distinguish foams of closed-cell structure (rigid foam, hard foam) and open-cell structure (semi-rigid foam, soft foam). The structure is strongly associated with the density of the foam. The more closed cells, the higher the density of the material. The structure has a significant effect on the use of foam. What are the physical and technical characteristics of polyurethane boards? High mechanical strength – high values of mechanical parameters of rigid PUR foam such as: compressive strength or resistance to shearing. Chemical resistance to diluted alkaline and acidic liquids and most organic solvents. What is the typical use of spray insulation? Spray insulation can be used both outdoors and indoors for roof, wall, floor and foundation insulation. Where can I use PUR foam insulation? Insulation based on spray polyurethane foam (PUR) can be applied on practically every surface, among others. on the surface made of sheet steel, steel, wood, tar, styrofoam as well as on wood-based plate. Each such surface can have different structure and shape. What does "Compresive strenght at 10% deformation = 150 kPa" mean? When using this material for flooring, can you step on it without worrying that the insulation board will get damaged or deformed? As the calculations show Crossin® PUR boards present high compressive strength and can be safely used as insulation for floors and foundations. In addition, the boards are characterized by very high insulation, high resistance to moisture and water, resistance to fungi, mold and rodents and insects. As a result, the Crossin® Insulations polyurethane boards are the ideal solution for floor and foundation insulation. How to best protect the spray insulation? Polyurethane foam requires UV protection (Ultra Violet), which causes the foam to degrade and lose its thermal insulation properties. Its mechanical strength is also reduced. Foams applied from the inside for roofs, walls, ceilings or floors do not require a direct coating to protect them from atmospheric influences. In the case when foam is sprayed outdoors, it should be protected with appropriate and dedicated coatings to protect it against moisture and UV radiation. The most important use of polyurethanes in buildings is insulation. It is believed that polyurethanes are an inexpensive, sustainable and safe way to reduce carbon emissions leading to global warming. Polyurethane insulation significantly reduces heat losses in households and offices in low temperatures. In the summer, they play an important role in the cooling of buildings, which results in less use of air conditioning. Insulation in buildings is applied in walls, roofs, pipe housing, boiler housing, and in floors. Proper insulation means in practice keeping the heat inside buildings in cool climates and keeping it outdoors in warm climates. Buildings are more durable and require less maintenance due to the high strength of polyurethanes. Insulating boards made of polyurethane are lightweight and durable, resistant to moisture and easy to install. Compared to other forms of insulation, foam and polyurethane boards use less space, which enables architects and designers to maximize the use of interior space. Polyurethanes not only contribute to energy savings, but also to the continuous reduction of the carbon footprint. What are thermal bridges and how can they be located at home? Thermal bridges are places in the insulation layer where, due to reduced thermal insulation properties (caused by joints) heat loss is increased. Thermal bridges show up, for example, because of improper technology, improper assembly or poor adhesion of one material to another (eg, between rafters and traditional insulating material, or as a result of splinters or slipping down). The easiest way to observe the effects of thermal bridges is to set the window in the trickle ventilation position. Then you can feel how much cold air enters the room. Thermal bridges are also visible in the case of frozen rafters, which often produce black vertical stripes on gypsum-plated ceilings. What is the heat transfer coefficient (U) and the thermal conductivity coefficient (λ)? Which of these factors should be considered when selecting insulation material? The heat transfer coefficient is a parameter denoted by the symbol U, given in units W / (m2.K), which determines the amount of heat flow through the surface of 1m2 of the building partition if in both sides the temperature difference are 1K. On its basis it is possible to determine heat losses separately for a given partition such as walls, roofs, foundations or windows. The lower the U factor, the lower the heat loss of the given partition. The value of this factor depends on the type and thickness of the material from which the walls are made, but also on the nature of the barrier. To determine the U factor, you need to know the thermal conductivity coefficient λ (lambda) for wall materials and insulation layers as well as the thicknesses of all masonry, insulation and finishing layers from which the bulkhead is assembled. When determining the value of U factor, possible thermal bridges and insulation leaks are also taken into account – if there are any, the value of the coefficient increases. The heat conductivity coefficient is the parameter marked with the symbol λ and given in W / (m.K) units. It determines the amount of heat flow through the unit surface of the material of a given thickness, if the temperature difference between its two sides is 1K. As with the U factor: the lower the value of the thermal conductivity coefficient (λ), the better the thermal insulation can be. Heat conductivity coefficient λ is a constant material property characterizing it in stationary heat transfer conditions. The most important feature of insulating materials is its declared heat conductivity coefficient λ [W / mK]. Does the insulation made of spray polyurethane foam breathe? Foam of open-cell structure is the so-called “more breathable” insulation, while the closed-celled foam is isolation from the “less breathable” group. However, for both materials it can be said that the polyurethane foam spray breathes, which is confirmed by numerous tests. What is thermal resistance (R)? What is more important in the choice of insulation material - the thermal conductivity coefficient or thermal resistance? Thermal resistance R is characterizes the material of a certain thickness. The higher the value of thermal resistance, the better the insulation. R is expressed in [m2K / W]. Thermal resistance R is the inverse of the coefficient U (R = 1: U); For a wall with a coefficient U = 0.2, the resistance R will therefore be 5.0. The value of the R factor depends on how fast the heat will escape from a home. Unlike the thermal conductivity coefficient and the heat transfer coefficient, the higher the thermal resistance, the better. λi – thermal conductivity coefficient [W/mK]. This implies that the better (lower) lambda and the greater the material thickness, the better the thermal resistance of the layer. Heat resistance for a 12 cm thick material with a thermal conductivity λ=0,039 W/mK wynosi 3,08 m2K/W. Can spray insulation be used in old (antique) construction? PUR foam spraying method is widely used in renovation works – insulation as well as in repair works, due to the fact that it is an exceptionally airtight and durable solution that does not require the removal of the previous material. In addition, the PU foam spraying method is extremely successful in the case of completely new buildings and rooms where durable and light solutions are implemented. Is spray insulation (polyurethane) safe for people? Spray insulation has been used for many years in residential construction, which is protected by building regulations which are being constantly tightened. That is why our PU foam systems have been thoroughly tested. In addition, they have all necessary tests, certificates and attestation. Also, our laboratory continually controls the quality and safety of the raw materials and finished products used. Spray insulations are even suitable for use in rooms for allergy sufferers. How to calculate the wall thermal resistance? The walls of the house are usually built of several layers (for example, a load-bearing wall and insulation or load-bearing wall, insulation and facade walls) – each of these layers has a different resistance to heat escaping from the interior. Thermal resistance across the wall is the sum of the resistances of the individual layers. In order to check the thermal resistance of the wall, it is necessary to add to it the thermal resistance of its layers.arstw. How to calculate the desired insulation thickness (Rd) needed to obtain a heat transfer coefficient of U = 0.2? The thermal resistance of the wall with a heat transfer coefficient of 0.2 should be R = 5.0. From the expected wall resistance (Rn = 5.0) we deduct the resistance R of the existing wall (Rs) and the coefficient of heat inflow and outflow, which is 0.17. The result will indicate what resistance should a layer of insulation have. Using the data given below, you need to find out what insulation thickness corresponds to the result. Example 1 (Simplified): Load-bearing wall from hollow blocks (Porotherm 18.8 Dryfix), 18.8 cm thick. Thermal resistance of hollow blocks – 0,67. Clinker brick facade, 12 cm thick and 0.11 thermal resistance. Thermal resistance of air gap 2.5 – 5 cm = 0.18. How much insulation should be applied so that the wall resistance R is 5.0? Thickness of insulation with a thermal conductivity coefficient of 0.040 should be 16 cm (then the thermal resistance of the insulation layer will be Rd = 4.0). The total wall thickness will be approximately 43.3 cm. Thickness of thermal insulation with a thermal conductivity factor of 0.025 should be 10 cm (then insulation resistance is Rd = 4.0). Example 2 (Simplified): Load-bearing wall from cellular concrete (Solbet Optimal Plus with a thickness of 24 cm). Thermal resistance of cellular concrete this thick, with density of 400 kg / m3 and a heat transfer coefficient of 0.105 is 2.29. How much thermal isolation do you need to get resistance R to be 5.0? 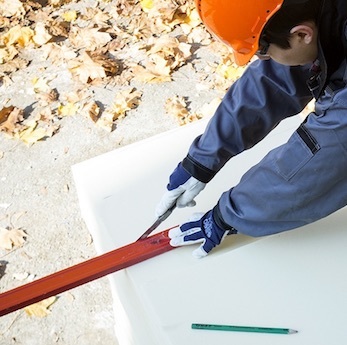 Thickness of thermal insulation with a thermal conductivity coefficient of 0.040 should be 11 cm (then the thermal resistance of the insulation layer will be Rd = 2.75). Thickness of thermal insulation with a thermal conductivity of 0.025 should be 7 cm (then the thermal resistance of the insulation layer will be Rd = 2.8). Does the spray foam absorb moisture? Polyurethane foams are characterized by a very low coefficient of absorption, which is one of the strengths of its use as excellent insulation. Should you always use vapor barrier? Not always. However, it should be remembered that the vapor barrier film is used primarily in rooms that are particularly exposed to moisture, among others: in bathrooms, kitchens, laundries and drying rooms. Can the spray insulation be applied only to the attic and roofs? Yes. PU foam insulation is perfectly adherent to most commercially available vapor permeable films, although not all commercially available films have been tested with our products. Can the spray foam be applied to the vapor permeable film? What characterizes the open-celled foam spray? When comparing open-cell foam to closed-cell one, it should be mentioned that the first one has a significantly lower density and thus is lighter for the structure of the building. It has a higher thermal conductivity coefficient (λ) and is well water-vapor permeable. Hence, after the use of open-cell foam the building “breathes”. At the same time, such insulation has very good sound-absorbing (acoustic) properties. This makes it an ideal material for the insulation of attic, ceilings and walls, especially in residential buildings. Taking into account the total value of the investment, polyurethane is not expensive insulation material. While one kilogram of polyurethane will be more expensive than many other products, the situation changes as you look at the cost of materials needed to obtain a certain insulation value of the building or its component (roof, walls, etc.).itp.). Polyurethane is an extremely effective and efficient insulating material and therefore the thickness of the insulating layer is small. Thin walls mean smaller sills, shorter posts and smaller roofs, and for low-energy buildings – there is no need for major changes that significantly increase costs. The use of thinner insulating material increases sales or rental income for buildings with internal lining. What’s more, thanks to its smaller weight, polyurethane insulation requires fewer fixing accessories and the construction of the building can in many cases be lighter. Polyurethane guarantees high mechanical strength and does not settle, which in turn reduces maintenance costs. All this makes polyurethane a very cost effective product. What substrates can be used with open-cell foam? At present, the most commonly encountered is a spray on a vapor permeable membrane or a formwork. This mainly concerns the isolation of the attic. The minimum temperature of the substrate in this case is 10oC. Other materials used in construction which are excellent for good adhesion with open-cell foam are: gypsum board (spraying on partition walls) and concrete (spraying on ceilings). It is necessary to cover the foam layer, eg with OSB boards fixed to wooden beams, to avoid accidental damage. IMPORTANT: Do not apply directly to the roof tile. While spraying the attic, first apply foam on the place of contact of the rafter with the formwork or membrane, then on the space between the rafters. This prevents the air from being trapped in the “corners”. Some contractors use a spraying method from bottom to top along rafters. Then the last layer is applied in the opposite direction. For membrane spraying, there is no problem with pressing the membrane to the sheet metal, etc. (the membrane must be properly tightened).